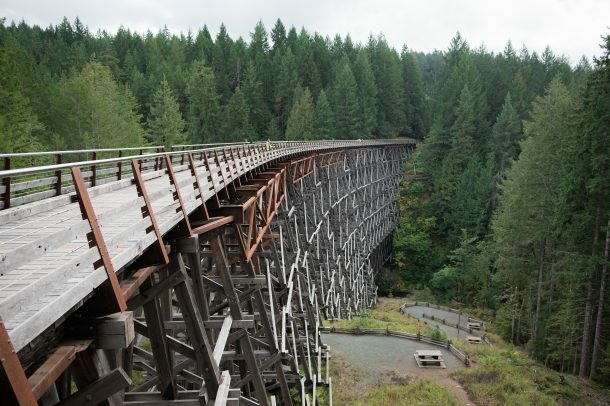 The Great Trail connects the country from coast to coast to coast, but once you arrive on Vancouver Island, the adventure is just beginning. Several small to medium-sized islands fill the distance between the mainland and Vancouver Island, offering the opportunity to explore B.C.’s west coast from a whole different perspective: the water. The Salish Sea Marine Trail weaves its way through the many islands, connecting the southernmost tip of Victoria to Lantzville, then across the water to the Sunshine Coast before ending in Squamish. While endeavouring the entire Trail section should only be attempted by those with their own equipment and good experience on the water, this fun island hopping itinerary is perfect for those looking to explore each island at their own pace. For this itinerary, you’ll spend the majority of nights camping on a beach, picnicking and slowly exploring the breathtaking Gulf Islands. 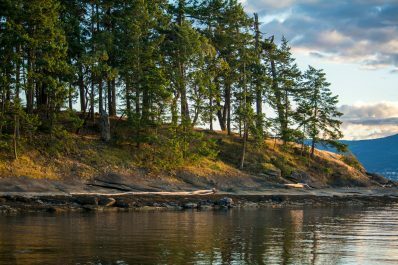 Start your journey on Salt Spring Island by setting up camp at Ruckle Provincial Park. Pitch your tent in the grassy meadow, relax with a good book in front of Swanson Channel, and lace up your hiking boots to venture along the beach trail and find new viewpoints of the channel. Wake up bright and early to catch the sun rising over the ocean. Enjoy your breakfast on the beach, listening to the sounds of birds chirping as they welcome another day. If you’re lucky, you might be able to spot a ferry passing by. But what’s an even greater attraction is the abundance of birds and marine wildlife you’ll find here, and the chance to watch the sunrise from the beach at Ruckle Provincial Park. With bellies full and camp all packed up, it’s time to hit the water for the 15-kilometre journey to Galiano Island. Head northwest to Yeo Point, then straight north to Prevost Island, the perfect midway point for a midday snack. For lunch, make a short stop at the rest area at James Bay on Prevost Island and have a quick picnic on the beach. This rest stop is right in the middle of the two islands, so it’s a great place to rest your arms for a little while before continuing on. When you’re ready, slide back into your kayak and continue heading northeast, but stick close to the beach until you’re around Peile Point. This is an active passage with two ferry routes, so it’s a good idea to wait until you have good visibility before venturing out into the crossing. From here, you have a choice in where you’d like to stay on Galiano. If you’re camping and don’t need any supplies, you can head to Montague Provincial Campground. The sheltered waters offer a peaceful location to set up camp, but there is a large raccoon population so you’ll want to securely store all food inside your kayaks when you’re not using it. If you’re in the mood for a warm meal, you can head over to The Crane and Robin Restaurant at Montague Harbour, where you can savour a salad bowl or fish tacos made primarily from local ingredients. Alternatively, if you prefer to have a few more amenities close at hand, you can head east around the island to Galiano Oceanfront Inn & Spa for a relaxing overnight stay in their coastal accommodations. The Inn has smart cars available for rent, so getting out to see more of the island couldn’t be easier. Wine and dine that evening in Atrevida Restaurant and visit Madrona del Mar Spa for a rejuvenating massage or facial. 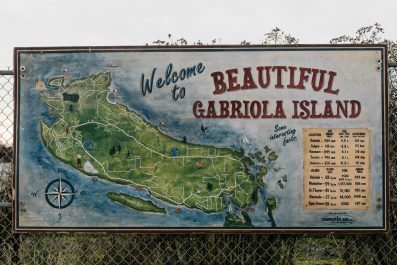 Before leaving Galiano, you’ll want to ensure you’re fully stocked for the next few days, as you won’t encounter any services or places to eat until your arrival on Gabriola. Bottom photo: Destination BC/Reuben Krabbe. 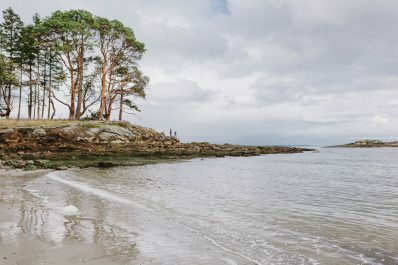 On day 3, you’ll continue your paddling journey for another 15 kilometres northwest to Cabin Bay on Wallace Island, a small, uninhabited island that makes up the Wallace Island Marine Provincial Park. A trail stretches from one end of this elongated island to the other, and it should only take about an hour and a half to hike there and back. The island doesn’t have any services or amenities, so make sure you’re well-stocked prior to arrival and keep in mind that you’ll need to pack all garbage out with you when you leave. After another beautiful breakfast on the beach, it’s time to pack up and prepare for the longest day on the water of this journey. 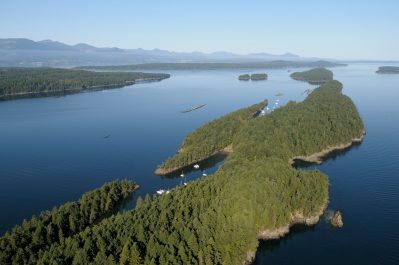 The distance from Wallace Island to De Courcy Island is roughly 20 kilometres. Along the way, you can stop at Whaleboat Island for a short break before continuing to De Courcy. As you paddle, it’s good to snug close to land where possible and keep an eye on the shoreline. These smaller islands are ripe with marine wildlife, so there’s a good likelihood of paddling past sea lions, harbour seals and otters resting on the rocky shores. Stick close to Valdez to find naturally carved sandstone caves and eroded rock features. Valdez is part of Snuneymuxw First Nation’s traditional territory. While it’s currently not open to the public, the views from the water are spectacular and it makes for a great commute from Wallace to De Courcy. 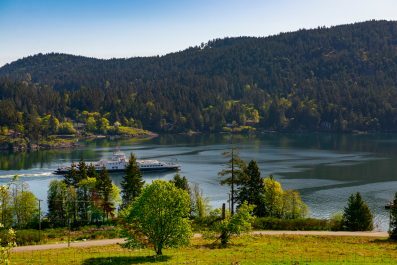 On the final day of your journey, you’ll leave De Courcy and continue heading northwest to Gabriola Island. 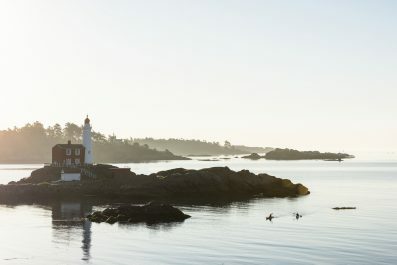 With Vancouver Island, Mudge Island, and Gabriola snugged closely together, the passages between the islands are very narrow and often busy during the summer months. Continue on the north side of Mudge Island, snuggling close to the southern edge of Gabriola along the rocky bluffs. Note that it can become very shallow and currents can flow with or against you through this area so paddle carefully and take your time to enjoy this lovely area. Paddle until you reach Descanso Bay, just slightly past the Gabriola Island ferry terminal. Descanso offers 32 oceanfront camping sites adjacent to the 113-acre Cox Community Park, where you can explore a small network of hiking trails. 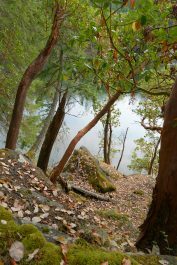 Eager to spend a little more time on Gabriola? When departing from De Courcy Island, you could instead head north to Silva Bay, home of Page’s Resort & Marina. There, you’ll find a campground, beach cottages, and other accommodations. The Gertie Bus, Gabriola’s community shuttle service, makes it easy to get to and from the marina to grab groceries from Folk Life Village. Silva Bay also features some great day paddling around the Flat Top Islands. Of course, no matter where you’re paddling, always consult the tide charts and current tables prior to and during your expedition. Tourism Vancouver Island is a not-for-profit organization amplifying the remarkable travel experiences within the Vancouver Island Region. Start planning your trip to Canada’s west coast playground by visiting their website. While this itinerary is great for experienced kayakers with all of their own equipment, several local kayaking companies have everything you need for a fully guided, multi-day marine adventure. In Victoria, be sure to check out Ocean River Sports. 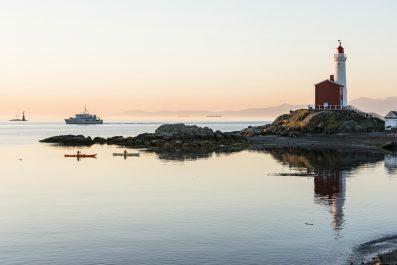 On Gabriola, visit Gabriola Sea Kayaking.